It may be the dog days of summer, but these days, D.C.-area dogs are being anything but lazy. Fitness centers, indoor pools and even outdoor excursions — all catered to canines — are popping up throughout the region in an effort to keep Fido fit and feted. WASHINGTON — At least three times a week, Scarlett Clayton travels from her home in Bethesda, Maryland, to a gym in Alexandria, Virginia, to work out for about 45 minutes. Once there, she tackles everything from endurance, to strength training, to agility. To be clear, Scarlett is a 4-year-old Portuguese water dog, and the gym she attends is Frolick Dogs Canine Sports Club. “We were looking for something that would be more than just a dog walk or just a gym where a lot of dogs are here,” said Scarlett’s owner, Joan Clayton. Kim Gilliam opened Frolick with her husband, Kevin, a dog trainer, in 2014, after recognizing a growing demand for an all-weather facility that provides mental and physical stimulation for pets. “You can only go on so many walks or go to the dog park so many times before you feel like [dogs] really need something more — especially in an urban environment like this where people have limited time, maybe no backyards, things like that,” Gilliam said. Inside Frolick, dogs have the run of the place. There are jumps, tunnels, weave poles, balance balls, and yes, even treadmills. Owners work alongside their pets, guiding them through the equipment, and trainers stand by to answer any questions. Phillip Yudson brings his 3-year-old Maltipoo, Susan, about five days a week. One of her favorite parts, he says, is seeing and playing with the other dogs. There is a friendly rapport between the other owners and pets, but Gilliam stresses that the gym is not the same as a dog park. “So if you think of it more like a human gym where you’re going to get a workout, you’re expecting to go and use the different equipment, maybe talk to a trainer for advice and then really work hard while you’re there,” she said. A few miles west, in Falls Church, Virginia, Lisa Castaneda straps a life jacket on her dog, Joey, just before he dives into an indoor pool that’s 8 feet by 12 feet. He fishes a toy out from the 5,000-gallon chlorinated tank and returns it to his owner. Castaneda opened Aquatic Paws, an indoor swimming and massage center for dogs, less than a year ago. The career nurse was in search of a place to take her own dog swimming for rehabilitative therapy and couldn’t find anything in the local area. She decided to take matters into her own hands. “I started out 17 as a lifeguard, rolling out of bed and into my bathing suit and into work, and I’m kind of ending my career rolling out of bed, into a bathing suit and into work,” said Castaneda, who also has an underwater treadmill at Aquatic Paws. Castaneda gets in the pool with each of her four-legged clients, often using treats or toys as motivation, and helps them work their joints in the weightless environment. Jets provide an option for resistance swimming; the underwater treadmill helps dogs build even more strength. Every week, Castaneda sees about 34 dogs from D.C., Maryland and Virginia, all of whom come to Aquatic Paws for various reasons. “I have dogs that come just for fun to swim … I have people who are active and out on the water a lot and want to make sure their dog can swim, I have dogs who are arthritic, post-surgical dogs, dogs trying to prevent surgery and everything in between,” she said. Of course, summer’s heat and humidity are also driving business. “Right now, I’m getting a lot of, ‘It’s too hot and we just want our dogs to exercise,’” Castaneda added. Frolick gym owner Gilliam says the D.C. area has always been rich in dog classes and playgroups, but now, there’s a growing demand for more individually-focused workouts. Sean Prichard picked up on this increased interest back in 2010 when he launched his dog “fitness adventure” company, Pant & Wag. Prichard says dog walkers really only give dogs a midday bathroom break and maybe a quick spin around the block. His business, on the other hand, focuses on exercise. Each day, Prichard takes his canine clients out on excursions to nearby destinations such as Rock Creek Park or Theodore Roosevelt Island. Once there, they hike, run or “do hills.” Sometimes, a weighted backpack is added for strength training. “It’s more like a cross-training approach so the dog is not getting overworked the same way, over and over again,” said Prichard, who works out with about 15 to 25 dogs a day in groups of five. However, unlike traditional walks and games of backyard fetch, this new breed of specialty workouts is not free. 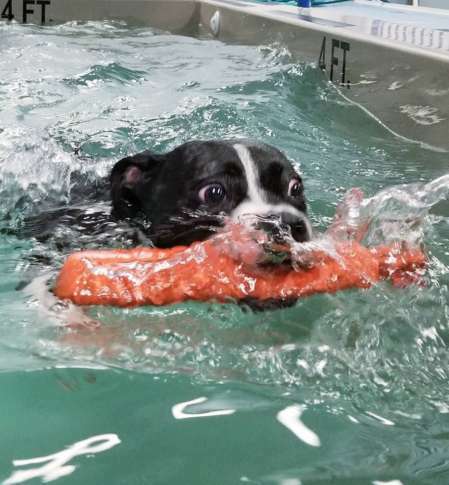 A drop-in at Frolick Dogs is $12, with no time limit, and a 30-minute session in the pool or on the underwater treadmill is $40 at Aquatic Paws. Just like for humans, packages, memberships and even birthday parties are also options.